In recent years there has been a radically increased interest in the Mayan calendar and especially its end and so many ask what this tells us about the future. Surprisingly, many people ask this question as if the answer had nothing to do with themselves or the choices they make. Few seem to have considered that the fulfillment of the cosmic plan will require of them to step up to the role of co-creators with this divine plan. This is not to say that human beings can just create anything they want at any point in time. The waves of consciousness brought by the Mayan calendar still defines the framework of our existence and what we may or may not be able to create in any given era. Yet, only the creativity that is consistent with a new wave will be favored and this will again be evident as we enter the ninth, and highest, wave of the Mayan calendar system. It is thus pertinent to ask what consciousness the ninth wave will create and what it will require of us to be able to step up to becoming co-creators with this wave. To address this we need to consult the ancient Maya and look at their only inscription, which describes the meaning of the end of their calendar, the Tortuguero Monument 6. This says that at that point in time the nine-step entity, Bolon Yookte, (Fig 1) will “descend.”* What this means in a more straight language is that a combination of nine cosmic forces, nine wave movements, will simultaneously manifest fully. In this ancient Mayan way of looking at the meaning of the end of the calendar there is thus nothing that speaks of an end to the world. Rather, what the end of the calendar system is all about is a completion, or fulfillment, of evolutionary processes that have been going on from the beginning of time and led the world to what it is today. These nine cosmic forces are the nine evolutionary progressions (Underworlds), each through thirteen energies that the prophetic Mayan calendar system is made up from, a system, which significant events in biological and historical evolution correlate extremely well with. The different progressions each develop a different frame of consciousness and currently we are most strongly influenced by the eighth wave. It is however the ninth and highest of these wave movements that will bring about the final shift to unity consciousness that will culminate as the calendar comes to an end. I feel it is imperative to realize that these nine cosmic forces are not acting separately from the human beings, but through their influence on us and so they will only manifest inasmuch as the humans align with them. I feel we also need to consider that the co-creation of this highest level requires that we are truly committed to its purpose. It is in preparation of this somewhat mysterious ninth wave that I am encouraging the celebration of the Conscious Convergence, July 17-18, 2010, as a point to focus on aligning with the highest and decisive wave of the Mayan calendar system, the ninth wave. Many people have an intuitive sense that the end of the Mayan calendar will bring a shift in consciousness. Yet, it is rarely clearly stated or explained exactly what is the source of such a shift, how it will happen or what would be its nature. Maybe however shifts in consciousness are actually a little less mysterious than many people tend to believe. In fact, shifts in consciousness have been happening from the beginning of time and continue to happen whenever there is a significant energy shift in the Mayan calendar, such as between any of its days and nights. The Cosmic Pyramid, or the nine-step-god (Bolon Yookte), whose nine waves will simultaneously manifest as the Mayan calendar comes to an end. Despite all these previous shifts in cosmic history I feel however that there is something very special and significant with the new consciousness that may be expected to be generated by the ninth wave. To begin with, for all that we know it is designed to bring a shift to unity consciousness where the human mind no longer will be dominated by any dark filter (see Fig 2). We will in other words become “transparent” and I believe this is the particular consciousness – seeing reality the way it is with no separation - that so many are waiting for. Not just any consciousness, but one that transcends the dualities of the past and aids the human beings to see the unity of all things. The reason that this kind of unity consciousness can be beneficial to the planet, and to mankind, is that it is one that leads to the transcendence of all separation (between man and woman, man and nature, ruler and ruled, east and west, etc). I feel that without the manifestation of such a shift in consciousness the world will sooner or later come to an end. People with a dualist and separating consciousness are somewhat like cancer cells in the body of the Earth with little regard to its larger whole and would eventually generate a collapse of its ecosystem. Only a shift to unity consciousness will forever stop the unchecked exploitation of the Earth and on a deeper level make us understand that we are part of creation and need to live in harmony with it. But will such a shift just happen automatically? Fig 2. Yin/Yang-polarities of the Human Mind created by the Five Highest Waves of the Cosmic Pyramid (Bolon Yookte). As mentioned above global consciousness shifts have their origin in the resonance with the cosmic forces described by the Mayan calendar. Hence, even though some may temporarily have experienced altered states of consciousness it is only in as much as a shift is induced in accordance with the cosmic plan, as we may understand this from the Mayan calendar, that it will be here to stay. Thus, only with the ninth wave may a shift to unity consciousness be regarded as something whose time has truly come. This is the wave that will cap off all of the previous evolution of mankind and build the bridge that will allow us to enter the new world that will follow upon the end of the calendar. On the other hand the student of the Mayan calendar will know that in order for a consciousness shift to manifest the human beings must be in resonance with it and at some point at least subconsciously have made a choice to align with. Hence, a large-scale consciousness shift is not something that can happen against the will of the human beings. Especially at the highest levels of evolution, such as the ninth, it can only happen through human beings that choose to serve as co-creators. Unfortunately many have been led to believe that there is some physical event to wait for, such as a pole shift, Nibiru, sun flares, or a galactic alignment, resulting in a passive attitude that has made the Mayan calendar seem disempowering and events as being outside of their power to influence. I believe however that, as the Hopi are saying, “we are the ones that we have been waiting for.” If we make the commitment to do so we can co-create unity consciousness with the ninth wave. As many readers of this article may have experienced there are spiritual practices, healing techniques and methods for personal development that in fact do cause temporary shifts in consciousness and the experience of unity of all things. Yet, what seems to be missing for such transformations to play a positive role on a larger scale is the commitment of a critical mass of people to create a world based on such unity consciousness. The idea behind the Conscious Convergence, July 17-18, 2010, is thus to create a powerful intention to do so. There is in fact one thing that is always in our power to do – and in the power of all human beings to do - and this is to intend to create and manifest unity consciousness. As the student of the law of attraction will know, all manifestation begins with an intention and without an intention there is no result. The Conscious Convergence – A Wave of Unity is thus for all those who intend to manifest unity consciousness. (It may be important to point out that it is not about intending any shift of consciousness, but one to unity consciousness). It is for those who authentically will say: “I intend to manifest unity consciousness.” Whatever you believe in, whatever worldview you have, it is still in your power to intend such a shift for yourself and others. The proposed dates are timely for setting the intention to do so in that it leads up to a manifestation of unity consciousness during the ninth wave in alignment with the cosmic plan. Without such a widespread intention it is doubtful whether there will ever be such a shift on this planet either individually or collectively. Based on the creation of such an intention in the Conscious Convergence it seems natural that people will also want to perform ceremonies and participate in spiritual practices that are manifestations of such a unity consciousness and seek whatever ways are possible to make permanent its results. In fact the Conscious Convergence should be looked upon as the beginning of a process toward deepened unity consciousness that never stops. This is the kind of commitment that I believe will be required. For those desiring to fulfill the cosmic plan, the Conscious Convergence should be an entry point to co-creating the ninth wave and something we should never want to drop out of. To start following the Mayan calendar on a daily basis from this point within the framework provided by the Ninth wave may in fact by itself be a significant factor for developing unity consciousness. Only with deadlines do projects become real and the calendar provides us with a time frame within which this is to be accomplished. It seems important that manifestations linked to the Conscious Convergence are planned very carefully and express this new unity consciousness so that they are not just thoughtlessly applied expressions of the old world we have been living in. If, for instance, artistic performances are part of the celebration, it seems wise to consider whether these are enhancing the experience of unity of all or if they create an experience of separation between the artists and the audience. The same may apply to the performance of ceremonies if the leader is not truly inclusive. A good example of a ceremony that is an expression of unity consciousness is in my mind when Jack Sully in Avatar is taken up as a member of the people of Pandora. Furthermore, if for the generation of unity consciousness valuable spiritual practices are used it may be considered whether irrelevant worship of founders or gurus can be excluded. Maybe silent and low key common practices are in fact the most powerful manifestations of unity consciousness, but regardless it is important that participants walk their talk and do not recreate dominance structures. How to do this would be for local organizers to decide and here it is only emphasized the importance of approaching this issue with fresh eyes and much attention paid to details. The name Conscious Convergence alludes to the Harmonic Convergence, a mind-opening gathering on August 17-18, 1987 (1 Imix and 2 Ik) and so it is important to point out the relationship between the two and why after so many years there is a second one, July 17-18, 2010 (13 Eb and 1 Ben)**. The important commonality between the two Convergences is that they both are (essentially) placed in time at a doubling of the 8th and 9th wave movements of the Mayan calendar and hence reflect energy shifts that herald the respective transformations of consciousness brought by these waves. Put in other terms: What the Harmonic Convergence meant to the quantum jump to the eighth wave the Conscious Convergence will mean to the quantum jump to the ninth wave. *** (Hence, it can be understood as a 2nd Harmonic Convergence). Or, if we include the seventh wave and its pre-wave (see Fig 3) for comparison, we may see that it will mean to the preparation for the ninth wave what the European Renaissance meant to the quantum jump to the modern world of industrialism. What is different now, and a challenge for the Conscious Convergence, is that this step cannot be said to be in the interest of separate individuals, but rather of all of humanity. Fig 3. 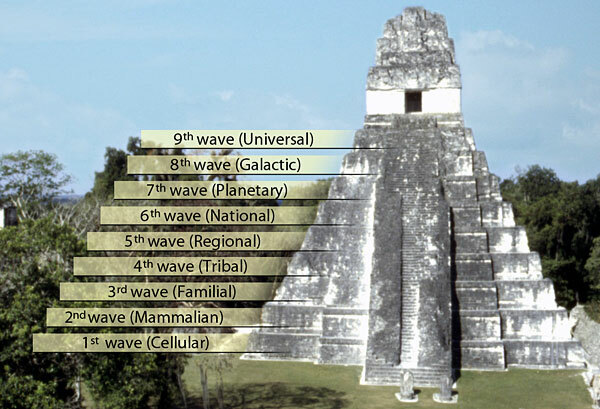 The three highest waves of the cosmic pyramid and their preparatory waves (in different scales). Examples of how the visions at the beginning of the pre-wave prepares for the full wave consider how the many inventions (on paper) by Leonardo da Vinci around 1498 presaged the real industrial inventions of the 7th wave or how the Harmonic Convergence presaged the much increased interest in the Mayan calendar in the 8th wave. From these parallels (Fig 3) we may see that the Conscious Convergence is not by itself the beginning of the ninth wave, which does not start until Mar 9, 2011. **** Rather this celebration initiates a wave, a pre-wave, that precedes and paves the ground for the ninth wave and directly leads into it. The Conscious Convergence is thus tremendously important as a point for creating the intention of unity consciousness even if this will only be fully developed later with the ninth wave. Maybe it will in fact be humanity’s last chance of setting such an intention, which almost with necessity must exist at an early point if we are to elevate ourselves above the economic chaos that we may expect in the years ahead. In my own view the hope for the future lies exactly in learning to surf on this ninth wave and so transcending, rather than getting caught up in, all the dualities and conflicts of lower Underworlds. If this is so it must also be expected that the Conscious Convergence will meet with much resistance from all those forces that are defending the ego-based operation of the old world and the massive hierarchies this has generated. As a small example of this a commercial media industry has now emerged around ”2012” where it is speculated about what is going to happen as if this were independent of the intentions and creative direction people choose. Naturally we will also come to be faced with our own cynicism and apathy towards the state of the world and thoughts will come back to us as: “this is not possible”, “the world will not change”, etc and it is for this reason a strong commitment will be needed. The Conscious Convergence is meant to be a very inclusive event that can be embraced by everyone who intends the emergence of unity consciousness regardless of his or her views about the Mayan calendar or otherwise. It is about positively and constructively using a window of opportunity and so participation in this only requires an insight that the consciousness shift must come out of the evolutionary processes that we are currently part of. Thus, a shift to unity consciousness is not something that will simply drop down on us from the sky at some date in the future, but can only evolve from the point where we are at the present moment. It is a basic tenet of the law of attraction that providence only moves when you are committed and so far the commitment for a transition to unity consciousness has not surfaced on a larger scale or even been proposed previously. My own view is that this is the last chance that human beings will have to truly align themselves with the cosmic plan. It is now or never and if you do not think that the Conscious Convergence has something to do with you you probably have not studied the Mayan calendar seriously enough. Hence, there can be no proxies for your participation in the transformation of the world as the calendar comes to an end. The final descent of Bolon Yookte, the Nine Waves (Nine Lords of Time or Nine Underworlds, or whatever name you prefer) is upon us and it is not without reason that the number nine is sacred in so many spiritual traditions. Nine is the destiny number of humanity and so it will be your own choice whether you want to be part of co-creating this destiny. Carl Johan Calleman, Stockholm, 11 Ahau (March 7, 2010). Carl Johan Calleman has a Ph. D. In Physical Biology from the University of Stockholm and has been a Senior Researcher at the University of Washington in Seattle and a cancer expert for the WHO. He is the author of The Purposeful Universe (Inner Traditions, 2009) a book that presents a new theory of biological evolution based on the Cosmic Tree of Life. He currently teaches at the online International Metaphysical University (http://www.intermetu.com). He held his first talk with the mention of the end of the Mayan calendar in 1979 and is the only professional scientist to have studied the meaning of the Mayan calendar (many professional Mayanists have studied the calendar as such, but not its reality basis in biological and historical evolution). He is among other things the author of Solving the Greatest Mystery of Our Time: The Mayan Calendar (Garev, 2001) and The Mayan calendar and the Transformation of Consciousness (Inner Traditions, 2004). His web site is www.calleman.com, and he is also associated with the web sites www.mayanmajix.com, http://mayaportal.lucita.net and www.shiftoftheages.com. ** The Conscious Convergence is not based on tzolkin days, but rather on the fractal time acceleration of the nine waves. Yet, we may still pay attention to the tzolkin day of the event. Thus July 17, 2010 is 13 Eb, one of the more mysterious day signs that is typically translated as The Road or Grass and, since it is linked to the number 13, this day is very typical of the Eb day sign. Road usually refers to the road of life or the road up the cosmic pyramid and grass refers to a grass roots event. Typically people born in this day sign are those that have the concern for seven generations into the future, do much good, but do not to seek the limelight for themselves. *** This is not how the Harmonic Convergence was originally understood by Tony Shearer and José Argüelles. Shearer, a Native American, who first proposed the dates, saw the Harmonic Convergence as the end point of Thirteen Heavens starting AD 843 and the Nine Hells (52-year periods) that had followed upon Hernan Cortez landing in Vera Cruz in 1519 and Argüelles promoted this scheme in The Mayan Factor. While this may have served as a guiding prophecy that intuitively led to identifying the dates of the Harmonic Convergence as August 16-17, 1987 (1 Alligator and 2 Wind) it in my view hardly serves as a theoretical understanding of why these dates were actually energetically important. Thus, the Harmonic Convergence was defined more mythologically than scientifically, since at the time the knowledge of the reality basis of the Mayan calendar was almost non-existent. We now know from Mayan sources that 13+9 is not to be regarded as a linear sequence, but that each of the Nine Underworlds was made up from Thirteen Heavens (Thus, according to the Mayan Books of Chilam Balam “the nine lords of time (Bolon-ti-ku) seized the thirteen lords of time (Oxlahun-ti-ku)” and so creation has an integrated pyramidal rather than linear structure. Whether people are aware of it or not, the entire evolution of the cosmos since the Big Bang has also been meticulously mapped out in light of the Mayan calendar and verified by massive empirical evidence. **** I have probably contributed myself to the confusion that reigns when it comes to the beginning date of the Universal wave movement and have given different times for this. What we know is that the calendar develops according to nine wave movements, where the longest one goes back to the birth of the universe, and they all differ from one another with a factor of twenty. According to such a fractal view of the prophetic Mayan calendar system the ninth wave would then be only 234 days long made up of 13 different uaxaclahunkin (18 day) periods. This places the beginning of the ninth wave at March 9, 2011 and that of the preceding wave (Conscious Convergence) at July 17, 2010. These are points in time that are expected to mark significant frequency increases and accelerations of time. As we approach the time when all the nine waves, developing at different speeds, will simultaneously come to manifest fully (28 October 2011, 13 Ahau) there is thus going to be quite complex patterns of overlapping of these waves. The Sacred Calendar rounds of 260 days will still have an unquestionable energetic existence and so these, as part of this overlapping, would continue the three stage rocket into the birth of the new world that started on 9.9.9 (Sept 9, 2009, please see http://www.calleman.com/content/articles/999_and_the_mayan_calendar.htm). For this reason the dates of the beginnings of the two next tzolkin rounds, May 27, 2010 and Feb 11, 2011, will also remain as important times for celebrating alignments with the cosmic plan and potentially very important for the preparation for the Conscious Convergence and the actual ninth wave respectively.